What do you do when you have extra watermelon? 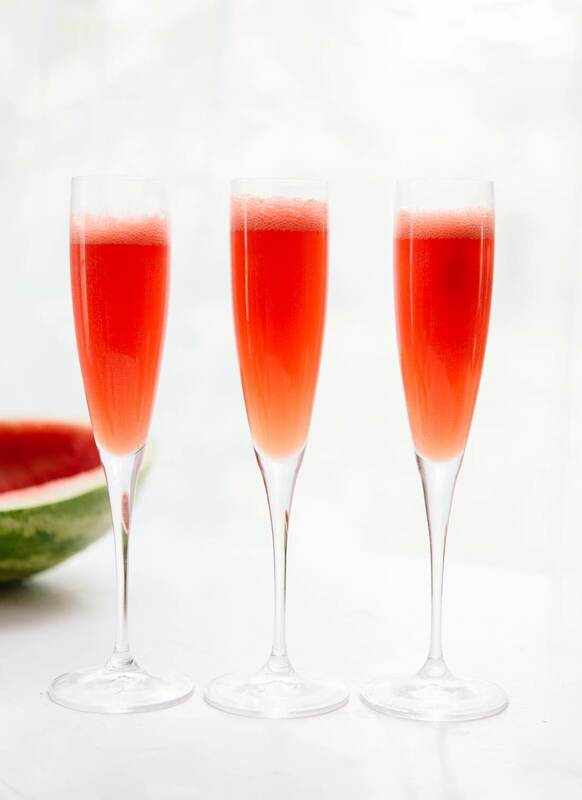 Make watermelon juice, or better yet, watermelon mimosas! 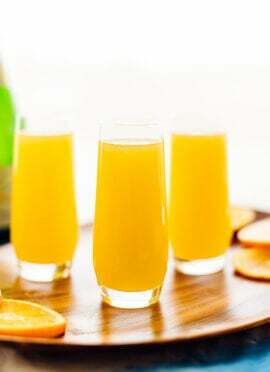 They are a fun twist on classic orange mimosas. These refreshing brunch (or any time) cocktails are supremely simple, but I couldn’t keep the idea to myself. We can’t let good watermelon go to waste. 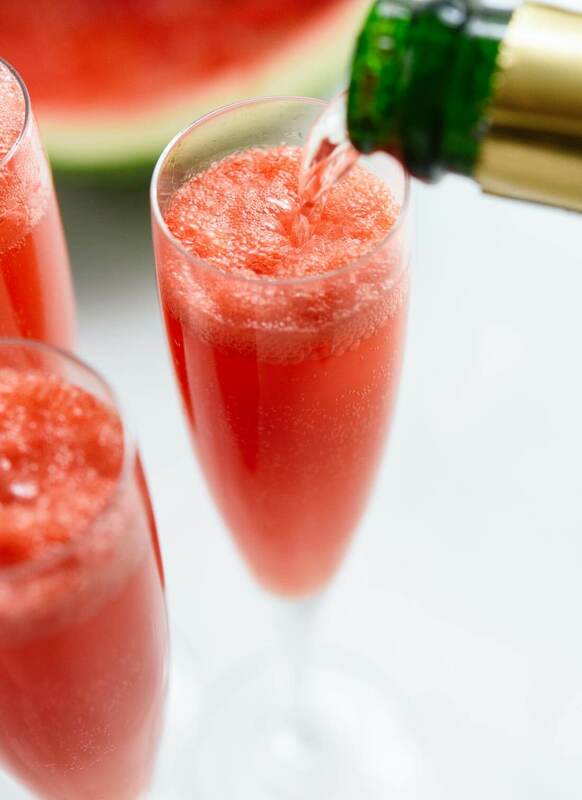 Here’s the trick with watermelon mimosas: they’re only as good as your watermelon. I recently bought a mini watermelon that was pale pink and kind of sour on the inside, and that watermelon would have made lousy watermelon mimosas. I used a pretty standard store-bought watermelon to make these, but I’m still day dreaming about the sugar baby watermelon I bought at a farmers’ market four years ago when I made that first batch of watermelon juice. Picking out all the seeds wasn’t my favorite activity, but it was worth it. If mimosas aren’t your favorite, check out my spicy watermelon margaritas from last summer. Also, I tried out Alexa’s trick for cutting watermelon on July 4th, and it was a big hit with my family, so that’s another fun way to prepare watermelon. Cheers to summertime! 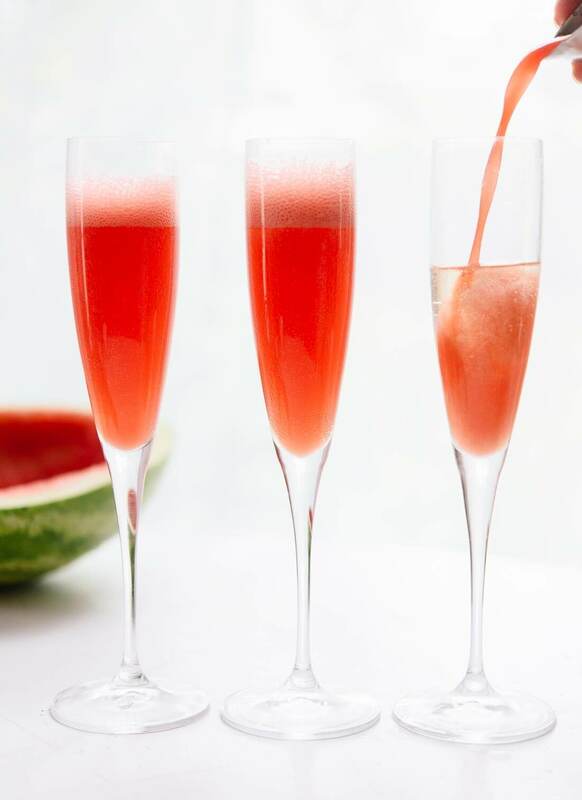 These watermelon mimosas are a refreshing summer brunch cocktail. They’re great any time of day, really! Recipe yields enough watermelon juice to make one Champagne bottle’s worth of mimosas (that’s 6 to 8 mimosas, depending on how boozy you like them). 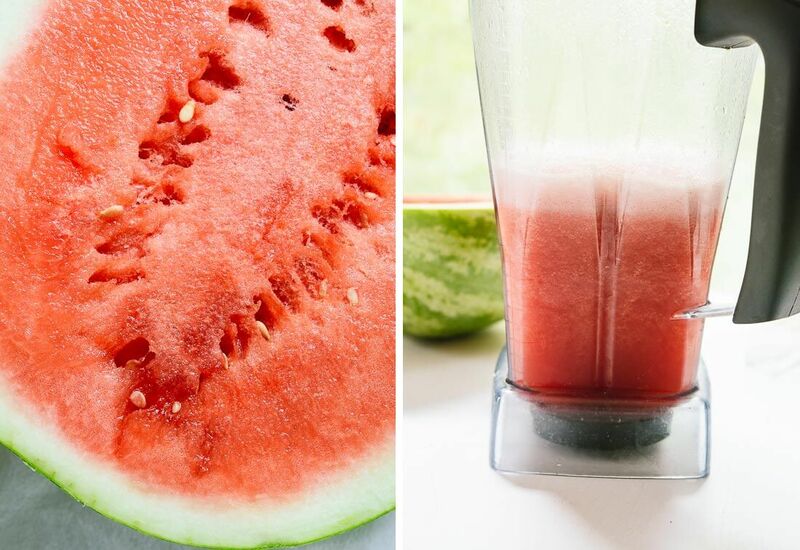 First, make watermelon juice: If your watermelon is not seedless, remove all of the black seeds first. Then, scoop all of the pink watermelon flesh into your blender, leaving the sour green part around the perimeter behind. Secure the lid on the blender and blend until it is completely smooth. Pour the watermelon juice through a fine-mesh strainer into a liquid measuring cup or bowl. Use a spoon to stir and press all of the juice through the strainer, then discard the solids. 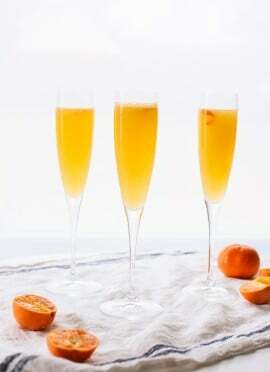 To prepare the mimosas: Fill each Champagne flute about halfway up with Champagne (you may need to do this just a little bit at a time to avoid overflow). Then, carefully fill each glass with watermelon juice, leaving about an inch of room at the top. Taste, and if you’d like it to be a little sweeter, add a tiny splash of simple syrup or St. Germain—this will really depend on the sweetness of the watermelon and your taste buds. Serve immediately! Recipe adapted from my watermelon juice. Thanks, Ashley! Hope you love it! Is it okay if I have champagne on a Monday? This makes it very tempting! love me some mimosa..and with watermelon it sounds very very good. Thanks, Dixya! I don’t think I’ve ever met a mimosa I didn’t like. What a lovely summer twist on a mimosa! Plus as much as I love watermelon, it’s always hard to consumer a whole one between my husband and I. Now I know what to do with the leftovers! This will be perfect for our next book club meeting! I tried a variation of fresh squeezed lemon and orange juices with Prosecco, but this watermelon sounds even better. Thanks! Hope these mimosas are a hit, Kris! Watermelon is definitely my favorite fruit during the summertime. I know these are great! I recently made some watermelon mojitos and they were so good! This recipe sounds amazing, I love mimosas and am anxious to try this recipe. Thanks, Monica! I hope you love them. Beautiful picture. Sounds scrumptious and I love watermelon, but have never had a mimosa of any type. I do like sweet, so thanks for the sweetness clue. And if I found a sugar baby watermelon I would love it even with seeds. Hard to find a really good watermelon here for some reason. Thanks for this lovely recipe! Thank you, Joy! I hope you find a good watermelon so you can make these soon. Peach and plum agua frescas sound amazing! This looks awesome! We made watermelon sorbet earlier this summer, and this reminds me a lot of this. Plus some alcohol ;) Definitely need to try this! Thanks, Nicole! Your sorbet sounds great! Love these! i love watermelon in anything so I will definitely be trying this. I rarely have leftover watermelon, but I could make an exception for these. They look divine. You’re a good watermelon eater! I never can finish a whole one. Thanks, Rachel! Hope that special occasion presents itself soon. Yum! Thanks Kate this is really good. I did not remove the seeds, and the colander got them all, even blended. Cheers! That is good to know! Thank you, Sabine! 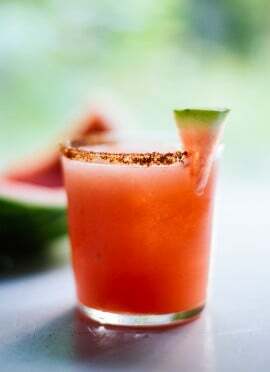 I’ve been eating loads of watermelon this summer, using it in a pretty drink like this one would be nice. I’ll have to give this one a try. Hope you love them, Celeste! Found your blog randomly :) I love watermelon. I could eat an entire watermelon alone. I should definitely try this! I’m glad you found my blog! Thanks, Charles. 2 summers ago, I had a watermelon with delicious flavor, terrible texture. We threw it in the blender with lime juice and froze it. The popsicles were delicious, but I found a better use: watermelon ice cubes for a gin and tonic. Ohhhh, I like that idea. Thanks, Stephanie! This looks so refreshing and bright. I must try it. This is prefect for a summer brunch! Its watermelon season right now. 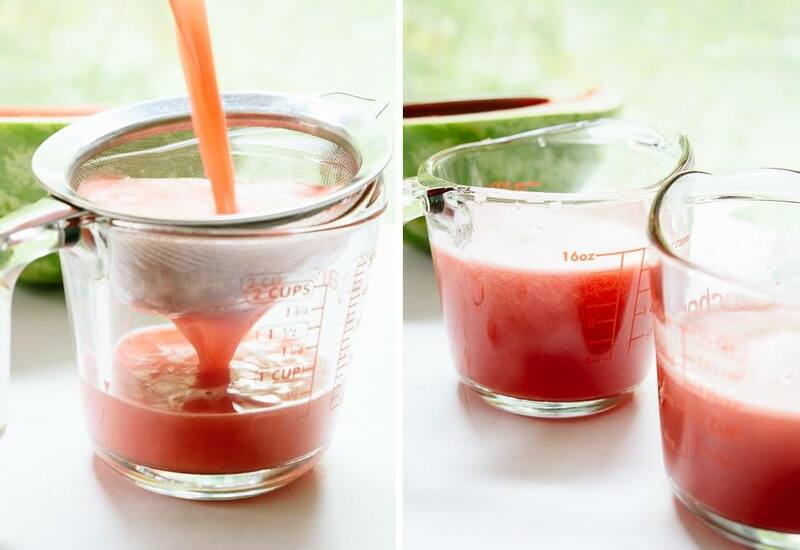 I love to eat watermelon and dink its juice, its really awesome to see this recipe from your blog. Thanks for very informative and tasteful recipe. Awesome! I’m so glad you found this recipe, Asan.